Prepare your tabletop for invasion! They came from another planet and now they want ours! Hundreds of alien soldiers run rampage as the Martians launch their invasion of Earth. In the small town of Greenville, the streets are choked with rubble and the civilians are dead, or in hiding. The army is on its way, but they may already be too late. This is the day that the people of Earth will remember forever more. This is the day that Mars Attacks! Simple rules, pre-assembled miniatures and simple, clip-together scenery mean that within minutes you can recreate the initial battles of the Martian Invasion. 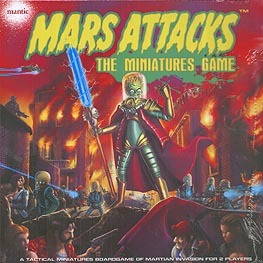 Pitting the first assault wave of the Martian fleet against the US Army, you will fight out the opening moves in an intergalactic war throughout the streets and ruins of a middle American town. The Martians have technology and surprise on their side, but the humans are not done yet! As the bullets and death rays fly, the only certainty is this: It's gonna get real bloody, real fast! As you progress through the scenarios in the book, more characters are introduced as the citizens of Greenville emerge from the rubble to take back their town. Each has unique abilities and their own special reasons to fight back. Their missions will see them engaged in recovering Alien Artefacts, sabotaging Martian communications, and even plotting the assassination of key Martian commanders. Meanwhile, the Martians will fight back with greater numbers and increasingly deadly weapons as General Tor attempts to wipe humanity off the map forever!